Announced since 2009, Metal Gear Arcade is finally available. 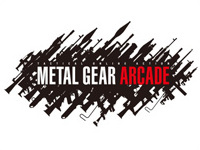 Metal Gear Arcade, developed by Kojima Productions team is an adaptation of Metal Gear Online released on PS3. With this title, Konami introduces a new way to play through stereoscopique 3D glasses "shutter glasses" equipped with sensors allowing on screen character to follow player head movement (head tracking) associated with a rifle assault also fitted with sensors, a small stick for moving forward/backward and various buttons to shoot, reload, lock on enemy, crouch and roll. In order to further enhance immersion, cabinets are networked nationwide and feature a 5.1 surround sound system, convenient for integrated voice chat. Eight players can compete simultaneously in different modes: "mission" mode (including 7 selectable stages), "Grenada Carnival" mode (a deathmatch where player throw grenades at opponents), ... By the way, the game can also be played in 2D, 3D may be disabled. The player begins his "career" as a simple soldier, but he can rise in rank. Winning a match grants him tickets allowing him to buy weapons and equipment. The game has over 80 customizable weapons. Anpanman Taiko de Dondon is out today in Japan, as Taiko no Tatsujin also developed by Bandai Namco, this is a drumming game but dedicated to young players. The cabinet is indeed much smaller and the game is more simple, it features 2 modes: "Story Game" and "Anpanman March". Anpanman is a character created in 1969 by Takeshi Yanase, an author of children's stories. Anpanman whose head is in fact a bun (anpan) filled with anko (sweet red bean paste) is used to sacrifice himself to feed hungry people. This character is still very popular in Japan, his animated serie (Sore ike! 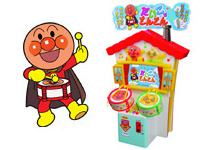 Anpanman) broadcasts since 1988 without interruption on NTV and many other merchandising products are sold in Japan. Thirteen years after G-Darius, the last episode of the Darius series released in arcade, Taito pleases his fans by releasing Darius Burst - Another Chronicle (Type X²) today. The recipe that made the success of Darius is still the same: horizontal scrolling, music by Zuntata and big futuristic fish bosses. 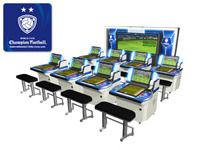 The cabinet features 2 large (32") LCD screens displaying a panoramic view of the levels allowing for the first time 4 players to sit at the same cabinet to play together. The cabinet is also equipped with a surround system and subwoofers (fitted in the seats), each player can plug headphones in the featured headphone jacks. The game supports the NESYS system (which allows online play throughout Japan and ranking checking using PC or mobile phone). 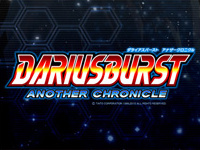 Darius Burst - Another Chronicle is quite similar to Darius Burst released on PSP but brings many improvements: significantly enhanced graphics, a new ship called Formula, new sound effects, changes in stages configurations and enemy attack patterns, the ability to change the direction of the ship and a new "Chronicle" game mode featuring 12 areas each divided into 3 stages. Four ships are available: "Origin" (Silver Hawk), "Legend" (Silver Hawk-1 Burst Type-1), "Next" (Silver Hawk Burst Type-2) and "Formula" (Silver Hawk Burst Type-3). Today is D-day for fighting game fans. 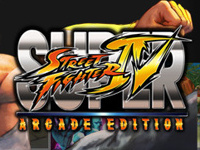 Because today is the day Super Street Fighter IV Arcade Edition hits Japanese gamecenters. This game features 37 characters including two new ones: Yun and Yang (already seen in Street Fighter III). As for each new version, Capcom refined balance between characters. Alternative costumes are available for all fighters (for example, Yun and Yang can be dressed as Chinese restaurant cooks). IC card used for Street Fighter IV is supported as well as NESYS system. Other new feature: the operator can set the cabinets to "tournament mode" in the manner of Super Street Fighter II - The Tournament Battle. In this mode, cabinets are organized in groups. The game is still powered by Taito Type X² system and is sold as upgrade kits. No international release is planned. Some American and European operators announced their intent to import the game. Despite the fact that the game language is selectable (English/Japanese), price is the main obstacle since unlike other fighters, Super Street Fighter IV Arcade Edition supports one player per machine only. Combined with a high price tag, this restriction makes it five times more expensive than the latest King of Fighters for a two player setup. The first games using NESiCAxLive, the new network service from Taito for Type X², are released today. This service allows the game to continuously receive online updates and new content. With the NESiCA IC card, players will be able to manage data for all their games on one common card. While playing, players earn points they can exchange for ingame bonuses. Some services will be free, others not. Besides the reissues of Battle Fantasia (Arc System Works) and Senko no Ronde Dis-United Order (G.rev), the release of the new BlazBlue (Arc System Works) is the main event today. 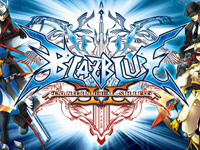 BlazBlue Continuum Shift II features balance changes for the 18 characters since new fighters joined the cast (Platinum the Trinity, Makoto Nanaya, Valkenhayn=R=Hellsing and Î¼ -No. 12- (Mu)). Other titles were originally planned to be released today, but they had to be postponed to the end of the month due to technical problems: these are Trouble Witches Episode 1 - Daughters of Amalgam AC (Bouken), Spica Adventure (Taito) et Power Instinct - The Commemoration / Gouketsuji Ichizoku (Atlus). Big Buck hunting game series is very popular in the USA, and this won't change any-time soon because Play Mechanix releases Big Buck World. This title combines Big Buck Hunter Pro Open Season and Big Buck Safari Outback in one package. Result: there's a total of 17 different animals to hunt (including 3 new species: ibex, rusa deer and blackbuck), 18 trophy animals, 77 critters, 51 bonus games (9 new), 51 hunting treks and 255 hunting sites on 4 continents (Africa, Asia, Australia and North America). Big Buck World offers a new game mode named Team Shootout. It allows two teams of 2 players each to compete on the same machine. New online competitions will begin on January 1st where players will win prizes (only for machines connected to CoinUp network). 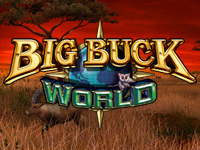 Big Buck World is available in many formats: standard cabinet with 27" monitor, deluxe cabinet with 42" LCD screen, super deluxe cabinet with 120" screen and usoftware pgrade kit for Big Buck Hunter Pro, Big Buck Hunter Pro Open Season and Big Buck Safari. 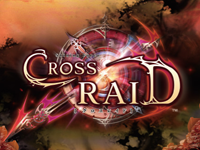 The first upgrade for Shining Force Cross, named Shining Force Cross Raid, is released today. It brings new events to which 6 players can participate (instead of 4 in Shining Force Cross). A new species (elf) makes its appearance, new weapons, new items and new monsters have been added and new skills are also available. As a reminder, Shining Force Cross was the first arcade version of the famous Shining series, an Action-RPG from Sega. Shining Force Cross Raid uses ALL.NET network and runs on RingEdge. 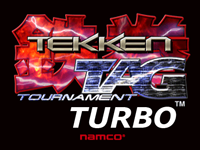 Tekken Tag Tournament Turbo is a special version of Tekken Tag Tournament made in 1999. Some players had the chance to play this game during the few times it was seen in operation. TTT Turbo is twice as fast as the original game and the gravity is altered to allow characters to do superhuman jumps and float during projections easing longer combos. All characters have different animations and some are even invisible. Why talk about it again ten years later? Because Tekken series producer Katsuhiro Harada said today that Tekken Tag Tournament Turbo was indeed a limited official edition (made for a special event) and not another pirate version à la Street Fighter II Rainbow Edition. He also published three videos of the game on TwitVid: video 1, video 2, video 3. Version 1.5 of Fast Striker was just released. This update offers a new Omake game mode. This is Maniac mode with 8 times more bullets, more enemies and new attack patterns. This new difficulty level was especially created with Japanese players in mind, those being used to more difficult shoot'em ups. Other changes: maximum chain number has been raised from 2047 to 4095 and D button is now used as auto-fire. A video showing Omake mode is available on YouTube. Fast Striker Ver. 1.5 MVS kit is available for €599.00 (Neo-Geo MVS mainboard required). If you own the original Fast Striker cartridge, please contact NG:DEV.TEAM consumer service and provide the serial number of your cart to obtain the update for free.